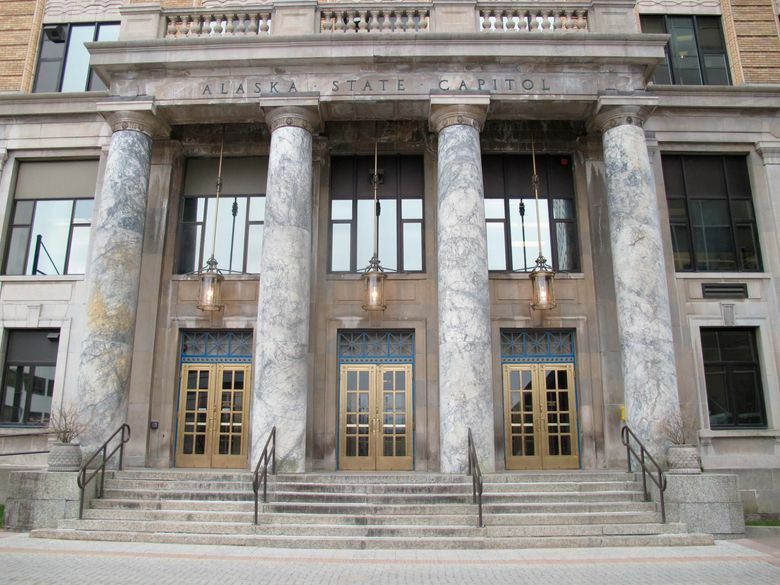 JUNEAU, Alaska (AP) — House Republicans disavowed an attempt involving some of their members to have a new legislator sworn in by taking an oath at a courthouse Wednesday. Gov. Mike Dunleavy appointed Sharon Jackson to replace Nancy Dahlstrom, who was elected in November to an Eagle River-area seat but became Dunleavy’s corrections commissioner before the session started. Jackson was not sworn in with other lawmakers Tuesday amid bickering over the proper procedure for accepting her nomination. The House has no organized majority in place. Republicans hold 23 of the House’s 40 seats, but legislators do not always organize strictly on party lines. State law also called for Jackson to be confirmed by fellow House Republicans. On Wednesday, a video posted on Rep. Josh Revak’s Facebook page showed him and Rep. David Eastman attending a purported swearing-in ceremony for Jackson at the Juneau courthouse conducted by a deputy clerk. Rep. Dave Talerico, a Republican House leader, said Republicans expect an official swearing in of Jackson on the House floor in accordance with state law and the Constitution. Talerico, in his statement, referred to Jackson as representative-appointee. Doug Wooliver, deputy administrative director with the Alaska court system, said a provision in state law gives clerks of court, judges and others authority to issue oaths. But he said that doesn’t give the oath itself any special legal status. “You can’t bypass the regular appointment process just by going to a clerk of court or a notary,” he said. Josh Applebee, chief of staff to Lt. Gov. Kevin Meyer, said the Department of Law told Meyer’s office the actions taken Wednesday did not constitute an official oath of office. Eastman said Jackson was confirmed by a majority of Republicans and deserves to be seated to vote on a temporary speaker. A message was left for Jackson and an email was sent to Revak. He said the Legislature’s rules call for the lieutenant governor or presiding officer of the House to swear in new members. Edgmon called the action destructive and unnecessary. He said the two caucuses were working on an agreement to seat a temporary speaker that would have allowed for Jackson to be sworn in while efforts to organize a majority continued. “This, in essence, acted to derail those conversations,” he said. A House floor session for Wednesday was canceled. Edgmon said House members had hoped to take steps on the floor to authorize staff to continue working. The Legislature’s human resources manager last week warned that a temporary staffing authorization would expire the first day of session, which was Tuesday. Rep. Gabrielle LeDoux, the former House Rules chair, said lawmakers were told to have their staff report to work Wednesday in anticipation of action being taken, according to Mike Mason, press secretary for the coalition Edgmon led the last two years. Edgmon said efforts were under way to circulate a letter expressing support for giving the Legislative Affairs Agency authority to keep staff on until a majority organization is formed, but that would need the signatures of all 39 current representatives.